Having looked, in the “theology chapter” of the forthcoming Getting Medieval with C S Lewis, first at our evangelical problem with Truth, then at the medieval scholastics’ way of understanding and teaching Truth, we now come to the central storyline of medieval theology: its unique attempt to hold faith and reason together. I start my discussion of this heroic attempt with a brief account of where the early church thought heresy came from (surprisingly: an over-active use of reason) and how early theologians and councils acted to preserve the integrity of the apostolic faith. The next post will show what medieval thinkers did with this early precedent when it came time to re-explain the mysteries of the faith for new socio-cultural realities. When I say that medieval thinkers held reason and faith in a delicate balance, I am thinking of their ability to use reasoned understanding and argument not to erase mystery, but to carefully couch and protect it. This was a premodern trait. The modern tendency – let us say, post-Enlightenment – has been to put our trust in what Stanley Grenz called the “omnicompetence” of reason–its supposed ability to fix all humans problems and solve all conundrums. The postmodern tendency, on the other hand, is to point to the man behind the curtain, or the emperor who has no clothes–to assume that anybody who claims to have figured things out via reason is actually making a power grab, disguising baser motives. The roots of this crucial admission of mystery lie in the early church’s struggle with the weeds of its theological garden: the heresies. It’s not that they struggled against heretics, but what they accused them of and the mode of their responding arguments that’s interesting here. Take, for example, the second-century apologist (defender of Christianity) Irenaeus (d. 202). One of the heretical groups he fought in his compendium Against Heresies he called the “Valentinians.” He accuses these people of not only teaching novel doctrines not found in the apostolic witness, but of twisting the parables, prophetic sayings, and apostolic teachings of scripture and thereby “dismember[ing] and destroy[ing] the truth.” They were like vandals who took apart a mosaic made of precious jewels that represented a king and rearranged them into a poorly executed image of a fox. The problem with these sorts of intellectual games, said Gregory and other fathers, was that those who played them left no room for the paradoxical mysteries at the heart of the orthodox faith. Forgetting the limits of their own human reason and the wonder and majesty of God’s person, they reduced God to a pale image and Christ to a mere man. This over-reliance on reason to the detriment of the real paradox and mystery preserved in the Scriptural record was taken to be a hallmark of heresy in general. 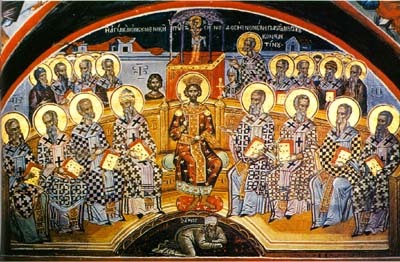 So when the early bishops (that is, revered regional pastor-teachers) got together and intensely studied the problem of the relationship between the divine and human natures of Christ—a very difficult question that caused a lot of strife in the post-Constantinian early church—they formulated a careful statement called the Definition of Chalcedon, which leaves a great deal of room for mystery. Instead of trying to force the mystery of the two natures of Christ into a single logical box, the Definition suggests some boundaries—to rule out some rationalizations that the logic-choppers might use to oversimplify the relationship between the two natures of Christ. These boundaries are called “the four fences of Chalcedon.” They are phrased like this: “one and the same Christ, Son, Lord, only begotten, to be acknowledged in two natures, without confusion, without change, without division, without separation.” What these “fences” leave room for and protect is an irreducible paradoxical tension that says that something can be both 100% one thing and 100% another thing. Of course, in the realms of mathematics, logic, or physics, this statement is impossible! But in the interest of preserving what seemed to them to be the clear witness of Scripture, the Chalcedonian bishops insisted on it. For the dynamics at work in this kind of “rationalization” – and they are not always, or even usually, nefarious or even intentional – see Jonathan Haidt, The Righteous Mind: Why good people are divided by politics and religion (Pantheon, 2012). “Their manner of acting is just as if one, when a beautiful image of a king has been constructed by some skillful artist out of precious jewels, should then take this likeness of the man all to pieces, should rearrange the gems, and so fit them together as to make them into the form of a dog or of a fox, and even that but poorly executed; and should then maintain and declare that this was the beautiful image of the king which the skillful artist constructed, pointing to the jewels which had been admirably fitted together by the first artist to form the image of the king, but have been with bad effect transferred by the latter one to the shape of a dog, and by thus exhibiting the jewels, should deceive the ignorant who had no conception what a king’s form was like, and persuade them that that miserable likeness of the fox was, in fact, the beautiful image of the king.” Irenaeus, Against Heresies, in Philip Schaff, Antenicene Fathers ix.ii.ix, http://www.ccel.org/ccel/schaff/anf01.ix.ii.ix.html, accessed 8-9-2013. Quoted in Philip Schaff, Nicene and Post-Nicene Fathers, ed. Philip Schaff and Henry Wace, second series, vol. IV (New York, Christian Literature Company, 1892), n. 3, p. 320. This entry was posted in Medieval Wisdom for Modern Protestants and tagged Augustine of Hippo, Christ, Council of Chalcedon, faith and reason, Gregory Nazianzen, Gregory of Nazianzus, Gregory of Nyssa, heresy, Irenaeus of Lyon, modernism, postmodernism, Stanley Grenz, two natures of Christ. Bookmark the permalink.